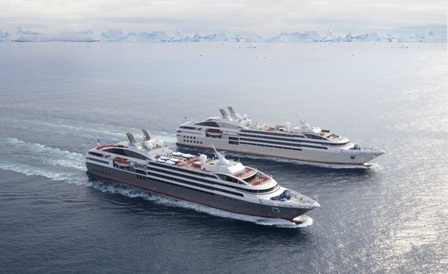 Cruise Traveller is excited to now represent Compagnie du Ponant in Australia. Compagnie du Ponant offer luxury yacht & expedition cruises in all corners of the world. They have a modern fleet of three, soon to be four, elegant boutique vessels and a sailing ship, venture to rare destinations only accessible by small ships, all with an intimate ambience, attentive service and gourmet cuisine. With the first Compganie du Ponant ship on its way to Australia & New Zealand next summer, their existing programs cover a wide range of exciting destinations; The Mediterranean, Northern Europe & the Baltic, Arctic Great North & Canada, South America, Caribbean & Central America, Asia, Antarctica & South Georgia and West Africa. Their range of itineraries appeal to those looking for luxurious, stylish and casually elegant voyages in an intimate environment, are priced in AUD, and offer exceptional value and inclusions. Additionally they offer low or no single supplements and extremely small premiums on balcony staterooms, subject to availability. Three new exciting voyages aboard L’Austral include: Bali to Cairns, 16 days, departing 12 December 2014; normally $10,067, now from $7,808 per person twin share, save $2,259, in a deluxe stateroom and only 30% single supplement. Alternatively, cruise Auckland to Darwin, 18 days, departing 15 February 2015; now from $7,179, per person twin share, save $2,561. Or board a voyage closer to home and cruise Darwin to Hong Kong, 17 days, departing 4 March 2015; now from $6,435 per person twin share, save $2,274. Both Auckland to Darwin and Darwin to Hong Kong are based on a superior stateroom and have no single supplement. Call our friendly boutique voyage & cruise specialists at Cruise Traveller on 1800 507 777, 07 5575 8094, via email, sales@cruisetraveller.com.au or visit www.cruisetraveller.com.au for further information.